Spring is here. 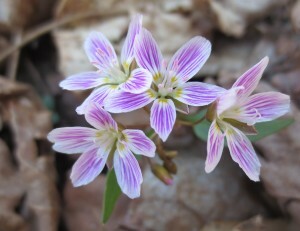 The melodious songs of hermit thrushes and the duck-like quacking of wood frogs fill the forests, and the fresh blooms of early spring wildflowers carpet the forest floor. 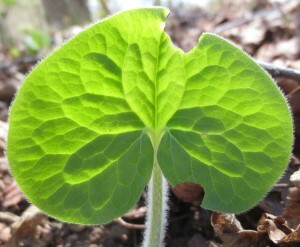 Â Now is a great time to get out in the woods (before the black flies and mosquitoes arrive!) and UVLT can help! 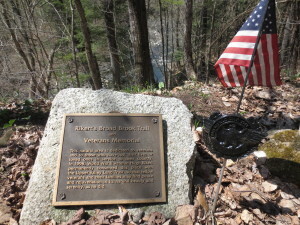 Weâ€™ll be hosting a walk along the Broad Brook Trail and Veterans Memorial in Sharon, VT on Friday, May 16th from 2:30 to 4:30, and we hope you can join us. As with most special places that have been entrusted to UVLTâ€™s stewardship, this land has a story. 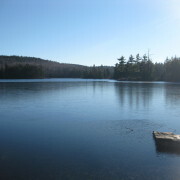 After returning from World War II, Hugh Rikert came back to Vermont, and bought this land. Tending it helped him heal from the gruesome experiences of the war, and in 1998 Hugh conserved his land as a memorial forest to veterans.Â Hughâ€™s wish was to preserve â€œsomething aliveâ€ as a way to give thanks and solace to our countryâ€™s servicemen and women and their families, and spring is a perfect time to see this place in its full glory as it wakes up from winter. With Armed Services Day on May 18th, and Memorial Day soon to follow, we will remember Hugh Rikert and give thanks for his service and his vision for this land as a place where servicemen and women and their families could experience â€œSolace in Natureâ€. Also, we are grateful for the work of our friends and neighbors who continue to help keep the Rikert Trail a beautiful place for reflection and healing. We hope you can come out and walk with us on the 16th. Â For more information, or to RSVP, contact Jason Berard at 603-643-6626, orÂ email Jason. Directions: Parking is limited at the trailhead. For those who would like to carpool to the trail, we will meet at the Sharon Park and Ride (Exit 2 on I-89) at 2:15pm. Trailhead directions: From the junction of Routes 14 and 132 in Sharon, follow Route 13 north for 0.4 miles and turn left onto River Road. Continue along River Road for 1.4 miles, passing under the I-89 overpass, until you reach Broad Brook Cemetery. Turn left on Broad Brook Road and go 0.8 miles. Turn right onto Harlow Road and continue for 0.8 miles to a trailhead pull-off on your right. Trail entrance is across the gravel road from the pull-off.